All Roads Shattered is the third book in the All Roads series of dark fiction stories and poems. In the last book you said you wanted to go darker and bring more sci-fi into the story. Did you want to continue that in book three or did you envision a different path? With All Roads Shattered I wanted to show darkness and variety, perhaps a different type of ending other than just brief character life lessons or moments. The characters are all superbly created, as usual. Is there anything from your own life that you put into your characters to make them more believable? Most of the time, no, at least not with this book. I did that with All Roads Home. In All Roads Shattered I wanted my characters to have their own life and story. Put my “empathic feet” into make believe shoes. I enjoyed all the stories in the collection, as they all inspired some reflection afterward. Is there a story that didn’t make it into the collection? If anything, a poem might get put to the side to be reworked but that’s about it. Do you find that you write stories that challenge you as a writer, or stories that are easy for you to write? I write what I feel or imagine, so it’s not difficult. I never mind a challenge if it inspires mournful beauty or captivating contemplation. 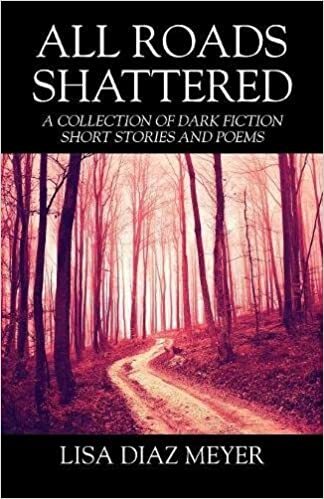 ALL ROADS SHATTERED, the third book of Lisa Diaz Meyer’s All Roads Collection contains two short story sagas, five multi-genre, dark fiction short stories and twelve macabre poems. 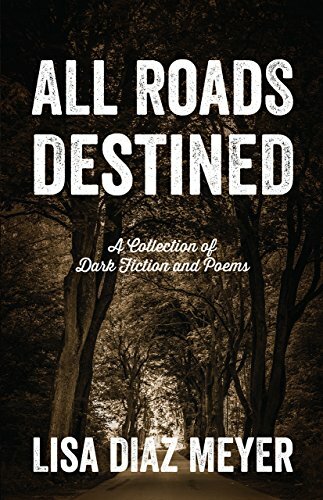 Other books in this dark fiction collection are ALL ROADS HOME and ALL ROADS DESTINED. All Roads Destined is a collection of stories from fantasy to science fiction with links back to your first collection. What was the inspiration for this collection of stories? As for the Outposts, I wanted to continue on since I’d left it as a cliffhanger in All Roads Home. I then felt I wanted to bring more loneliness and some addiction awareness into the equation as these subjects, real or imagined, can be sad and frightful. I felt that this book was a bit darker than the last collection. What were some themes you wanted to capture while writing this book? I did want to go darker, bring more science fiction in but based off subjects that make people uncomfortable. Again the addiction issue, some odd poetry. As you said in your review, the short story The Crone was your favorite. It was also mine, too. And I love when something like that can just come upon me, the imagery and the way I want it to be read. You also included a selection of poems in the section titled The Fragments. What was your favorite poem from the collection and how did you pick which poems made it into this collection? The poems or fragments I write in between or even during a WIP. My favorites in this book were Clocks and The Water Globe, both having to do with the passage of time. What is your process like for writing short stories? Does it differ from longer novels? There’s a certain pace with short stories that I prefer. I may be inspired to write a longer novel one day, just not yet. Destiny is what we bring to the world where the roads are stained with tears and blood, and paved in eternal stone. In Part One, the continuation of The Outpost Trilogy shifts from post apocalyptic to science fiction. Part Two, The Enduring contains five dark fiction short stories. Part Three, The Fragments include fifteen poems of urgent struggle and destination. 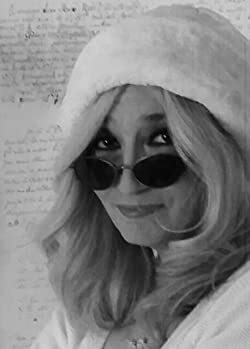 New York author, Lisa Diaz Meyer relates to the odd, macabre & funereal. ALL ROADS DESTINED is the second of her ALL ROADS trilogy. All Roads Home is a collection of your short stories covering many genres and topics. Did you write this collection with the intention of putting them together in a book or did you write them separately? All the stories, poems and plays were written at different times in my life and I decided to put them together thinking to showcase the many different genres and writing styles I enjoy. The book is split into six sections with each covering a different theme. The Enduring was my favorite section. What was your favorite from the collection? The Outposts were my favorite to write as it was my first time trying a post-apocalyptic story line which I later I turned into a saga that runs throughout my current books. What do you find enjoyable and challenging about writing short stories over longer novels? I like the idea of creating short stories and many different worlds. The challenge is to pack as much of a punch in a small amount of pages and create characters to love, hate or identify with in a short amount of time. I am working on my fourth book of dark fiction short stories and poems. I am hoping to have it published in the early months of 2019 or sooner. A collection of bizarre short stories, poems and plays. All Roads Destined by Lisa Diaz Meyer is the second book in the All Roads Trilogy. Consisting of a collection of dark fiction stories and poems, the book is divided into sections including one story in four parts, four shorter stories and a selection of poems to finish off with. 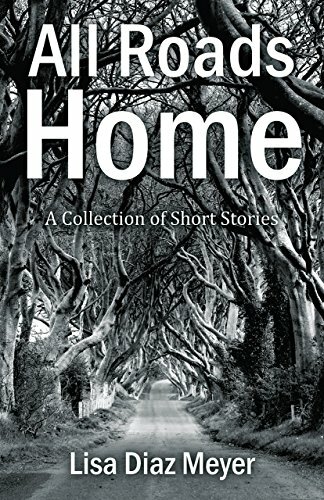 I would strongly recommend reading Lisa’s first collection, All Roads Home, as the four-part story in this collection continues from a story in the first book, charting the characters activities since we last read about them in book one. Slightly different than the format of her first collection, All Roads Destined leads with a prologue and then three parts of one short story, alternating in each chapter with Mitchell, Gerard, and Georgia. The Building, The Alpha Post, The People’s Government and Notas Territory are all chapters of a story which cleverly links back to the first book and includes the character of Georgia, whom we discovered was being held as the subject of scientist’s aim for cancer immune females. Previously, Georgia finally escaped the people who were working on her as an experiment and now has her baby Sylvie with her as well as her partner Mitchell, equaling her own little family. However, there’s still a way to go and escaping her captor’s clutches was only the first part of this journey. Immediately dark at the first-page of the prologue, with a superbly built up tension permeating the very start of this book, we begin with Georgia once again, though we know very little about the mass confusion that is happening at this moment in time. The flip between narratives in this story is an excellent way at holding your interest long enough and succeeds at explaining a little about the primary doctor, Dr. Gerard, who worked on Georgia for many years. This is one short story which is experimental in structure, but fascinating to read! The middle section of the collection is titled The Enduring, and it is here where perhaps my favorite story of the book is, called The Crone. So simplistic in its action but so stylish in its deliverance, this is the story that highlights how easy it is to conjure up any one of Lisa’s characters instantly. However, here the prose also excels. With Harret and the returned Berkstadt left to live out their remaining time together in their beautiful kingdom, this was a thoroughly satisfying and complete short story. Finally, Lisa has included a selection of poems in the section titled The Fragments. Personally, I found these poems more satisfying than those in the first collection. I enjoyed the poetry section even more as I’m very selective about poems and won’t automatically reach for a book of poetry when purchasing my preferred books. So, to have it included in a collection such as this encourages you to read it, seeing as you’ve read the stories, and its addition opens your eyes to something new and different. Ultimately, The Fragments serves as an entirely satisfactory ending to yet again, a beautiful collection. All Roads Home by Lisa Diaz Meyer is a fictional short story collection. Covering several genres, the book is divided into six parts titled The Outposts, The Enduring, The Oddities, The Particulars, The Fragments and The Play Versions. With each section and story being utterly unique, this book really is a mixed bag of offerings. Nowhere is this more obvious than, besides the four sections of short stories all varying greatly in their genre, the collection also consists of a part of poetry and The Play Versions which really are that: five of the stories in the collection written in play format! The first section of the collection deals with a world that is hard hitting. In the story titled The Safe Room, this links back to the previous short story in its representation of women, cancer, and childbearing. With such stark descriptive passages of the cloning and curing process detailed, this section hits upon the more awkward of subjects that aren’t always spoke about comfortably. Dealing with religion verse science, this section may be quite an eye-opener, considering its placing at the very start of the collection, but its subject matter does indeed turn the tables making you question just who, if anybody, has such a right at this stage. The Enduring section starts off with a story which is most certainly that – enduring for its characters. What begins as a heartfelt story of a mother’s struggles quickly turns itself on its head when the story ends. However, nothing physical has changed, her situation remains dire, but she has found peace in her heart and mind and can now approach her situation from a more positive perspective. This story emphasizes Lisa’s ability to change tact and emotion in just a few short pages and sums up the book in its entirety. All of Lisa’s characters, though only with the reader briefly, are very easy at catching our attention and therefore it’s easy to recognize their plight and see the story from their point of view. That Lisa can create such emotions in her readers through characters that appear fleetingly is a wonderful achievement. For me, The Enduring was a favorite section. Packed full of emotions, there is one story where the action begins, plays out and ends in a matter of just two short pages! If you’re not too sure whether this selection of stories is for you, I urge you to read The Christmas Break first. Immediately this highlights Lisa’s fluidity in prose as well as her ability to create a fascinating collection of characters, and all within a few short sentences. With superb powers of observation, a beautiful and haunting writing style on many of the pages, alongside an ability to push topic boundaries (Hitler and Jesus at a dinner party, need I say more!) this is truly a collection you must read for yourself. If Lisa is this good at creating such an enthralling collection of short stories, I can only imagine what she would be like with a full-length fictional novel!